You see them every day on the highway. Tractor trailers, also known as semi-trailers, move a whopping 68% of goods delivered in the U.S. More than 5.6 million are registered in the U.S, and there are 3.2 million truck drivers in the U.S, who collectively drive about 140 billion miles a year to get goods to their destinations. But what do you know about the different kinds of tractor trailers? 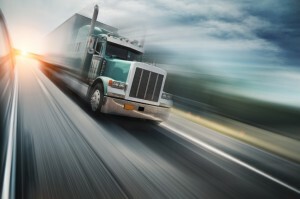 You might be surprised to find out that there are several types of tractor trailers. This is the most common kind of tractor trailer. The trailer is in the shape of a wedge, meaning that it is taller in the back than in the front. These trailers come in 28-foot as well as 45-foot sizes. A 45-foot wedge has a capacity of about 3,000 cubic feet. These trucks carry containers that can be shipped overseas on container ships. These containers have about half the capacity of a box truck, at 1,172 cubic feet. Also known as “reefer trucks,” these trucks are essentially box trucks that also have a refrigeration unit behind the cabin of the truck in order to keep the contents of the trailer cool. Flatbed trucks are used to transport things of odd or oversize dimensions that would not fit in a normal trailer. Tanker trucks carry liquids, and range in capacity from 1,000 to 9,000 gallons. They can carry food grade and toxic grade liquids, and often require a special license to transport the latter. Every day out on roads and highways across the country, there are accidents involving tractor trailers and semi-trucks. Many of these accidents are avoidable if the driver of the other vehicle had been mindful of how to drive around tractor trailers. There are many factors to consider when driving alongside or near these large vehicles. It’s important to follow many safety regulations to avoid any accidents. 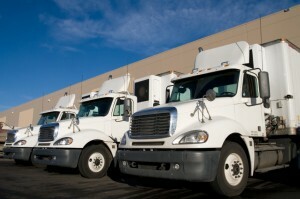 Give trucks adequate space to navigate – Trucks routinely carry 80,000lbs or more of weight. Sometimes their tires can blow out unexpectedly, possibly causing them to swerve. They are also susceptible to winds, especially when they are completely empty. It can create a “sailboat” like effect that can cause the truck to be blown back and forth while the truck is driving. 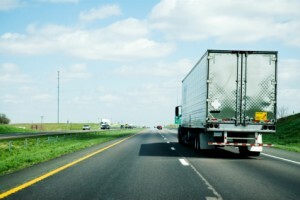 Giving a truck adequate space is one of the sure ways to avoid an accident. Beware of truck’s blind spots – Trucks have more blind spots than the normal car does. It’s safer to pass a semi-truck on the left rather than the right. Most of the time, the trucker won’t even know you’re there on the side of their vehicle, so it’s best to pass them as quickly as possible if you can. It’s dangerous if they decide to make a sudden lane change. Give trucks room for right turns – Many tractor-trailers make wide right turns, so giving them space to do so is absolutely essential. Never try to pass a truck on the right side, especially if they are trying to make a right turn. Trucks are big and need A LOT of room to make those kind of turns. It’s important to observe safe driving laws when driving around trucks. If you follow these few tips, you’ll be able to share the road with tractor trailers and you’ll be able to avoid any accidents that could occur from driving unsafely around these tractor-trailers and trucks. And if you need freight transported, choose Evan Transportation! Preventative maintenance of your truck’s exhaust system will keep it from damage and you from worry. The exhaust system in a large truck is located under the hood but most of its parts are contained under the frame. Trucks need an exhaust system to keep its temperature normal, control emissions, and mute the loud noise emitted from the engine. To protect the exhaust system from rust and other natural elements, follow these tips. Look for unusual smoke. This unnatural smoke would be thick and billowing – the muffler could have damage. Check for holes. Does the muffler have holes? This could be damage from corrosion or rust and should be repaired as gases such as carbon monoxide can seep through, which would be fatal. If the hangars are rusty, they could break while the truck is in motion. Listen for strange noises. Are you hearing sounds coming from the bottom of the truck? A loud rumbling is a sign of a faulty muffler. Upgrade your system. A high-flow exhaust system will let the motor breathe and will be less likely to become damaged. Position the components. The parts of the exhaust system should be 1 1/2 inches away from the fuel, brakes, and any other unprotected elements. Many of the employees at Evan Transportation are trucking veterans and experts on transportation. Evan Transportation prides itself on customer service; the employees can direct you on next steps and provide the best preventative maintenance tips for your truck exhaust system so it can make it through the long haul. Contact us today for all of your freight shipment needs or call us at 443-673-3365.